LESSON: Self-discipline is a trait that many of us acquire through experience. Oftentimes, it’s our own arrogance or ignorance in how we conduct ourselves that leads to these growing pains. It typically takes being met with failure or defeat to realize just how undisciplined we truly are. Take a look over the sports landscape; what is the one constant all the great athletes have? They have a burning desire to always improve. They know if they are not self-evaluating strengths and weaknesses, preparing mentally and physically, committing to practice regularly, honing their craft (down to the smallest detail), then they will be passed in a blink of an eye by the competition. But how can this concept of discipline be translated to our young athletes in a practical manner? That sounds so simple, but far too often our young athletes (even us adults) want life to go a certain way and move at our own pace; when in actuality, God is in complete control, and He has a plan for us all. God is providing the instructions, and it is left to our youth to open up and be willing to listen to what He wants them to do. Krzyzewski makes a great point, but if we do what WE think is right, in the manner WE see fit, and at the time most convenient for US, then that isn’t true discipline because our actions are only for self-enhancement and not serving God’s purpose. 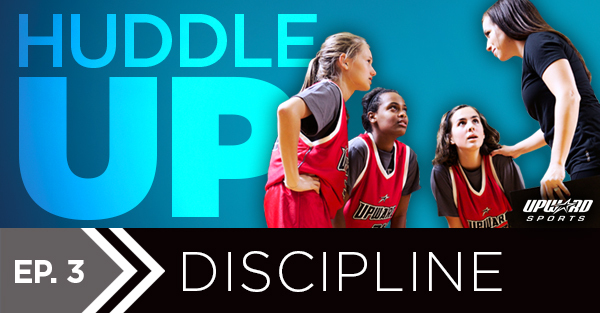 In your next Huddle, talk to your young athletes about the importance of being disciplined in everything they do. Be sure to stress that their efforts shouldn’t be for self-promotion; but through their diligence, others might see and come to know Christ. Read the Bible daily with them. Help them understand the importance of "quiet time." Get them into a small group with their peers at church. Before the Season Starts - Reinforce commitment to being disciplined, in the game, and in everything they do from school to their free time to their faith. During Practice - Victory comes by limiting mistakes and winning all the small battles during a game; both require discipline to hone their craft during practice as an individual and as a unit. SCRIPTURE REFERENCE: 1 Corinthians 9:24-27 (NIV) 24 Do you not know that in a race all the runners run, but only one gets the prize? Run in such a way as to get the prize. 25 Everyone who competes in the games goes into strict training. They do it to get a crown that will not last, but we do it to get a crown that will last forever. 26 Therefore I do not run like someone running aimlessly; I do not fight like a boxer beating the air. 27 No, I strike a blow to my body and make it my slave so that after I have preached to others, I myself will not be disqualified for the prize. Hebrews 12:11 (NIV) 11 No discipline seems pleasant at the time, but painful. Later on, however, it produces a harvest of righteousness and peace for those who have been trained by it.